Backgrounds Urothelial carcinoma of the urinary bladder (UCUB) is prevalent in developed countries. It often shows genetic instability and is associated with amplification (or gain) of various oncogenic genes or suppressive genes. Rsf-1, a subunit of ATP-dependent chromatin-remodelling complexes that mediates ATPase-dependent chromatin remodelling, confers tumour aggressiveness in certain carcinomas. The authors evaluate the Rsf-1 gene and expression status and its associations with clinicopathological features and survival in their UCUB collection. Methods Immunohistochemistry was used to assess the Rsf-1 expression profile in 295 UCUB specimens, and was found to correlate with clinicopathological data. Real-time RT-PCR and fluorescence in situ hybridisation were used to detect RSF-1 mRNA expression and gene dosage in 20 independent cases. Western blot analysis was used to evaluate Rsf-1 protein expression in human urothelial cell lines. Results Rsf-1 overexpression was demonstrated in 101 cases (34.2%), and was significantly associated with advanced primary tumour (p<0.001), nodal metastasis (p=0.004), higher histological grades (p=0.001) and frequent mitoses (p<0.001). Moreover, it was predictive in disease-specific survival and metastasis-free survival in both univariate and multivariate analyses (p<0.0001 for both). Although RSF-1 gene amplification can be barely detected, its mRNA expression is significantly enhanced in tumours with higher primary tumour (p=0.041) and positive nodal statuses (p=0.010), respectively. Rsf-1 protein was abundant in invasive urothelial carcinoma cells but was not benign. Conclusions Overexpression of Rsf-1 is associated with higher tumour stage and poorer clinical outcome. The current study by the authors suggests gene amplification-independent mechanisms driving Rsf-1 overexpression during UCUB tumour progression. Amplification of the chromosomal region 11q13 is frequently seen in various types of human carcinomas, including high-grade ovarian serous carcinoma, squamous cell carcinoma of head and neck and NPC, etc.11 ,13–15 Many studies also show that high-grade UCUB repeatedly shows amplification or gain in the chromosomal region 11q13.16 However, the gene status and expression of Rsf-1, and its correlation with survival, have never been investigated in urothelial neoplasm, thus prompting us to evaluate Rsf-1 expression and its clinical significance in our UCUB case collection. For the immunohistochemical study and survival analysis, 295 consecutively treated primary UCUB cases were retrieved, retrospectively, from the archives of Chi-Mei Medical Center between 1998 and 2002 under the approval of the Institutional Review Board (IRB10102-004). For the determination of RSF1 mRNA expression and gene dosage, an independent cohort consisting of 20 fresh tumour specimens was detected with real-time RT-PCR assay, and fluorescence in situ hybridisation (FISH) was performed on tumour sections of these cases, respectively. All cases were classified as urothelial carcinoma, not otherwise specified. Other histological variants were excluded. Detailed information is provided in the online supplementary data. Tissue sections were deparaffinised and rehydrated, and were submitted for antigen retrieval, followed by incubation with primary monoclonal antibody targeting Rsf-1 (1:200; Upstate, Lake Placid, New York, USA). A labelling index was recorded as negative (0), weakly positive (1+), moderately positive (2+), strongly positive (3+) or intensely positive (4+), to denote none labelled, 1∼24%, 25∼49%, 50∼74% and 75∼100% of tumour cells that displayed moderate to strong nuclear staining. Detailed information is provided in the online supplementary data. To circumvent the contamination of the surrounding non-neoplastic cells, we adopted Veritas automated LCM system (Arcturus Engineering, Mountain View, California, USA) to isolate pure UCUB cells. Detailed information is provided in the online supplementary data. From LCM-isolated tumour cells of UCUB, total RNAs were extracted, quantified and reverse-transcribed. Using pre-designed TaqMan assay reagents (Applied Biosystems), we measured mRNA abundance of RSF1 (Hs00213155_m1) with ABI StepOnePlus System. The fold expression of RSF1 relative to normal urothelium was calculated by comparative Ct method after normalisation to POLR2A (Hs01108291_m1) as the internal control. Bacterial artificial chromosome clones containing the genomic sequences of RSF1 (CTD-2313I10) and control region targeting (RP11-79M22) were purchased from Bacpac Resources (Children's Hospital Oakland, CA, USA). Detailed information is provided in the online supplementary data. Three human urothelial tumour cell lines including J82 and TCCSUP were obtained from ATCC (Manassas, VA 20108, USA), and TSGH8301 was purchased from the Food Industry Research and Development Institute (Hsinchu, Taiwan). A non-tumourigenic urothelial primary cell, HUC (ScienCell Research Laboratories, San Diego, CA), was used as a control. These cells were grown based on the suggested medium and conditions. Total cell protein extracted was separated on 4∼12% gradient sodium dodecyl sulphate polyacrylamide gel, transferred to polyvinylidene difluoride membranes, and then probed with antibodies against Rsf-1 (Upstate, 1:2000). Detailed information is provided in the online supplementary data. Clinical factors, such as patient gender and age, were collected. Histology and primary tumour (pT) status of tumours were graded based on the two-tiered WHO/ISUP consensus classification, and the 7th edition of the American Joint Committee on Cancer system, respectively.1 ,3 Other pathological factors included nodal status, mitotic activity, tumour necrosis, vascular and perineurial invasion, were also documented. To analyse a series of different values, a labelling index of ≧3+ was set so as to classify all cases into low and high Rsf-1-expressing groups. The associations among the clinicopathological factors and Rsf-1 expression status were evaluated using the χ2 test or Fisher's exact test. The end points of analysis of the whole cohort were disease-specific survival (DSS) and metastasis-free survival (MeFS), which were calculated from the date of operation for UCUB until the presence of disease-related mortality and metastasis developed, respectively, or the last follow-up appointment. Univariate survival analyses were performed using Kaplan–Meier plots and compared by the log-rank test. Multivariate model was performed using Cox proportional hazards regression, including parameters with univariate p<0.05. Statistical analyses were performed using SPSS V.14.0 (SPSS Inc) software package. The clinicopathological characters of our patients are listed in table 1. Most of our patients were >60 years of age during the initial diagnosis (n=214, 72.5%). One hundred and seventy-two (58.3%) cases were non-invasive (pTa, figure 1A) or early invasive (pT1), and 123 of cases were in advanced stages (pT2-T4, figure 1B). Lymph node metastasis was observed in 23.6% of the patients. More than 80% of cases were classified as high grade. Tumour necrosis and high mitotic activity (≥10), pathological features associated with high-grade tumour, were found in 104 and 156 cases, respectively. Besides, vascular invasion and perineurial invasion had been observed in 49 and 20 cases, respectively. 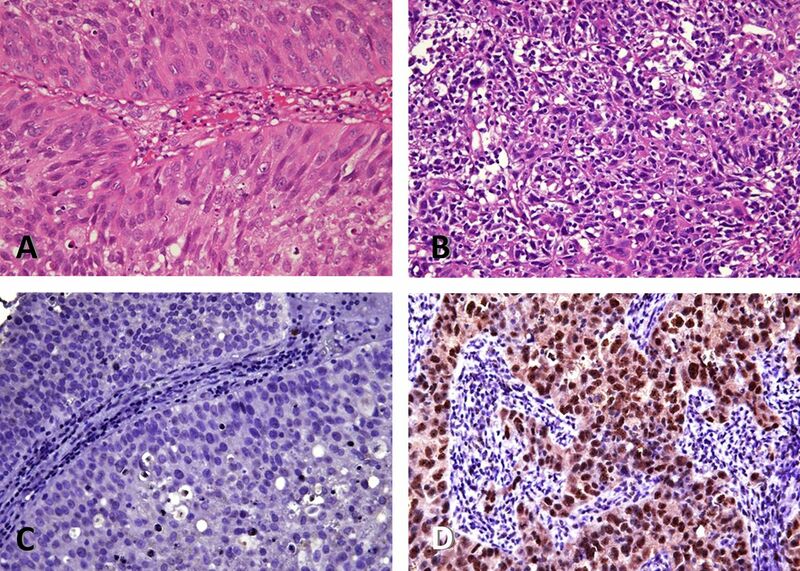 Representative low-stage urothelial carcinoma (A) and a high-stage infiltrating one (B), which demonstrated low (C) and high Rsf-1 immunoexpression (D), respectively. Low Rsf-1 expression, as determined by a 0+∼2+ staining (figure 1C), could be appreciated in 194 (65.8%) tumours while the remaining 101 cases demonstrated high Rsf-1 (3+∼4+, figure 1D) expression. The frequency of high Rsf-1 expression increased as pT statuses progressed (16.7% in pTa, 34.1% in pT1 and 46.3% in pT2-T4). As summarised in Table 1, high Rsf-1 expression was strongly associated with increment of pT status (p<0.001), lymph node metastasis (p=0.004), higher histological grade (p=0.001), as well as the mitotic activity (p<0.001). In the 20 cases tested, RSF1 mRNA expression was higher in UCUBs with higher pT status (p=0.041) and positive nodal status (p=0.010), suggesting its role in tumour progression (figure 2A,B). Quantitative real-time RT-PCR (qPCR) analysis revealed that Rsf-1 mRNA expression was significantly increased in urothelial carcinoma of the urinary bladder (UCUB) with higher primary tumour status (A) and positive nodal status (B). Fluorescence in situ hybridization for examination for Rsf-1 gene was negative for amplification in both cases with low Rsf-1 mRNA expression (C) and high expression (D). (RSF1 gene, red; reference probe, green). Of the 20 UCUBs evaluated for gene dosage, there was no case shown to have RSF1 gene amplification, even in those with high RSF1 mRNA expression levels (figure 2C,D). As shown in Table 2 and figure 3, together with other clinicopathological factors, patients with UCUB presenting with Rsf-1 overexpression, pursued a more aggressive clinical course with a significantly shorter DSS (p<0.0001, figure 3A) and 3MeFS (p<0.0001, figure 3B). Notably, Rsf-1 overexpression was not only univariately predictive of worse outcomes (table 2), but remained prognostically independent to portend poor DSS and MeFS in multivariate analysis (table 3), along with pT stages and mitotic activity. Kaplan–Meier plot shows that an Rsf-1 expression status conferred significant prognostic impacts in both disease-specific survival (A) and metastasis-free survival (B). According to the Western blot analyses, Rsf-1 was detected in invasive cancer cells including J82, TSGH8301 and TCCSUP, but not in HUC, which suggests its correlation to the urothelial oncogenesis (figure 4). Assessment of endogenous Rsf-1 protein expression in human urothelial tumour cell lines using Western blot analysis. Rsf-1 expression was abundant in invasive cancer cells (J82, TSGH8301 and TCCSUP) but was undetected in normal human urothelial cells. Bladder cancer is commonly seen and highly prevalent in developed countries. Currently, clinicopathological parameters, such as multiplicity, histological grade and tumour stage, remained the most important predictive factors for disease recurrence and progression.1 Although there are increasing numbers of molecular markers found to be associated with the tumourigenesis of UCUB, the factors regarding tumour progression remain largely unclear.3 ,17 Moreover, the prognostic impact of some potential markers, such as p53, are controversial, which may be due to difference in study design, size, population and inter-observer interpretation.18 It is thus desirable to identify novel molecular markers and to evaluate its alternation from gene to protein expression levels. Rsf-1 (HBXAP), a subunit of ATP-dependent chromatin-remodelling complexes that is produced by the RSF1 gene, hydrolysed ATP to generate energy for chromatin architecture alteration and modification during nucleotide synthesis, transcription regulation and DNA repair.7 Located at 11q13.5, RSF1 product was not only found overexpressed in many cancers, including ovarian serous carcinoma and head and neck tumours, but also associated with disease aggressiveness.9–12 Our studies show similar results, as high immunoreactivity to Rsf-1 antibody is found associated with advanced tumour stage, high histological grade, nodal metastasis and frequent mitotic activity in UCUB. The RSF1 mRNA level increased as UCUB advanced. Western blot assay of tumour cells confirmed that the Rsf-1 protein expression is abundant in UCUB cells but not in normal urothelial cells. Finally, univariate and multivariate analyses revealed that high Rsf-1 expression profile is significantly correlated with DSS and metastasis-free survival. Amplification of the chromosomal region 11q13 is frequently detected in UCUB that is associated with tumour stage progress.16 There are several established and putative oncogenes harboured in this region, including MEN1, CCND1, FGF3, EMS1, etc.1 ,13 Recently, BM Zaharieva et al reported that CCND1 (encoding cyclin D1), FGF3 and EMS1 genes were amplified or gained in UCUB.16 Of note, IM Shih et al showed RSF1 amplification that was associated with Rsf-1 overexpressed in tumour cells with 11q13.5 amplification in ovarian carcinoma.9 However, our results show that RSF1 gene amplification was not detected in UCUB. It seems that Rsf-1 overexpressed in UCUB might be attributed by transcriptional or translational modulation, instead of gene amplification. Further studies will be needed to clarify the mechanism in detail. UCUB is characterised by chromosomal abnormalities frequently present with a high number of genetic alterations involving multiple regions on different chromosomes. Of these, losses of 2q, 5q, 8p, 9p, 9q, 10q, 11p, 18q and the Y chromosome, as well as gains of 1q, 5p, 8q and 17q are consistently found.1 Interestingly, a recent study shows that overexpression of Rsf-1 can promote chromosomal instability through activation of DNA damage response.19 Thus, it is likely that the overexpression of Rsf-1 in UCUB might participate in tumour progression by promoting chromosomal abnormalities. More studies are required to clarify the exact role of Rsf-1 in promoting such a phenomenon. Unravelling the contribution of Rsf-1 proteins for the aggressiveness of UCUB will be an interesting topic for further study. Mutation of TP53 is frequently observed in UCUB, and the frequency increased as the tumour stage and histological grade progressed.18 A previous study showed that TP53 mutation is a prerequisite for Rsf-1-induced DNA damage.19 Thus, the interaction of mutant TP53 and overexpressed Rsf-1 is crucial in tumourigenesis. Furthermore, tumour cells with Rsf-1 expression may show drug resistance.14 ,20 For example, Choi et al have shown that Rsf-1-enhanced the paclitaxel resistance in ovarian cancer cells.14 The above mentioned information may explain the poorer survival in our advanced patients with Rsf-1 overexpression. However, more efforts may be needed to comprehensively explore the biological and clinical significance of Rsf1 expression in UCUB. In conclusion, and for the first time, we have demonstrated that Rsf-1 expression correlates with the adverse clinicopathological features of UCUB, and confers a significant survival determinant in both disease-specific and MeFSs. More importantly, its overexpression seems to be less likely associated with RSF1 gene amplification. Further work is essential to elucidate the detailed mechanisms regulating Rsf-1 expression, and its biological significance in UCUB. The expression of Rsf-1 protein, a subunit of ATP-dependent chromatin-remodelling complexes, correlates with clinicopathologic features of urothelial carcinoma of the urinary bladder (UCUB). Its overexpression strongly correlates with several adverse prognostic factors, such as high pT stage, higher histological grade, high mitotic activity and lymph node metastasis. Rsf-1 protein overexpression in urothelial carcinoma of urinary bladder, unlike ovarian carcinoma, might not be associated with RFS1 gene amplification. Rsf-1 protein overexpression is predictive of poor disease-specific survival and metastatic-free survival in patients with urothelial carcinoma of the urinary bladder, suggesting its role in UCUB progression.
. World Health Organization Classification of Tumours. Pathology and Genetics of Tumours of the Urinary System and Male Genital Organs. Lyon: International Agency for Research on Cancer (IARC) press, 2004:93–109.
. Proposal for changes in cystoscopic follow up of patients with bladder cancer and adjuvant intravesical chemotherapy. Br Med J 1994;308:257–60.
. AJCC Cancer Staging Manual. 7th edn. New York, NY: Springer, 2010:497–505.
. The SWI/SNF complex–chromatin and cancer. Nat Rev Cancer 2004;4:133–42.
. Chromatin remodeling and cancer, Part II: ATP-dependent chromatin remodeling. Trends Mol Med 2007;13:373–80.
. Chromatin remodeling: why it is important in cancer. Oncogene 2001;20:2988–90.
. Functional analysis of the subunits of the chromatin assembly factor RSF. Mol Cell Biol 2003;23:6759–68.
. HBXAP, a novel PHD-finger protein, possesses transcription repression activity. Genomics 2002;79:523–9.
. Amplification of a chromatin remodeling gene, Rsf-1/HBXAP, in ovarian carcinoma. Proc Natl Acad Sci USA 2005;102:14004–9.
. Amplification of oncogenes in human cancer cells. Bioessays 1998;20:473–9.
. Overexpression of a chromatin remodeling factor, RSF-1/HBXAP, correlates with aggressive oral squamous cell carcinoma. Am J Pathol 2011;178:2407–15.
. Rsf-1/HBXAP overexpression is associated with disease-specific survival of patients with gallbladder carcinoma. APMIS 2011;119:808–14.
. Array-based comparative genomic hybridization analysis identified cyclin D1 as a target oncogene at 11q13.3 in nasopharyngeal carcinoma. Cancer Res 2005;65:8125–33.
. Functional analysis of 11q13.5 amplicon identifies Rsf-1 (HBXAP) as a gene involved in paclitaxel resistance in ovarian cancer. Cancer Res 2009;69:1407–15.
. Serous tubal intraepithelial carcinoma upregulates markers associated with high-grade serous carcinomas including Rsf-1 (HBXAP), cyclin E and fatty acid synthase. Mod Pathol 2010;23:844–55.
. High-throughput tissue microarray analysis of 11q13 gene amplification (CCND1, FGF3, FGF4, EMS1) in urinary bladder cancer. J Pathol 2003;201:603–8.
. Molecular pathways of urothelial development and bladder tumorigenesis. Urol Oncol 2010;28:401–8.
. p53 immunohistochemistry in bladder cancer — a new approach to an old question. Urol Oncol 2010;28:377–88.
. Rsf-1, a chromatin remodeling protein, induces DNA damage and promotes genomic instability. J Biol Chem 2010;285:38260–9.
. Associations of Rsf-1 overexpression with poor therapeutic response and worse survival in patients with nasopharyngeal carcinoma. J Clin Pathol 2012;65:248–53. Additional materials are published online only. To view these files please visit the journal online (http://jcp.bmj.com). Funding This work was supported in part by grants from the Chi-Mei Medical Center (CMFHR10044) and the Department of Health, Taiwan (DOH99-TD-C-111-004). The authors are grateful to the Translational Research Laboratory of Human Cancers of Chi-Mei Medical Center for providing critical technical assistance. Ethics approval Ethics approval was provided by the Institutional Review Board of Chi-Mei Medical Center (IRB10102-004) approved immunohistochemical, FISH and qRT-PCR study by using human samples. Data sharing statement The original immunostaining and statistical data are available from the corresponding author.